Mostly, this is random stories from my various trips as I collect them, but I've a wee backlog to get through too and those will pop up occasionally. Feel free to leave comments. I've often told folk that I enjoy "reading" a map in the same way as lots enjoy reading books. It's during these sessions that interesting features come to light and these can inspire trips to spots one might otherwise overlook. An example of this was while I was looking at OS Landranger 34. There. leaving from the Tomdoun Hotel is a clearly-marked track which simply heads north and disappears into Loch Loyne, only to emerge 800metres or so later and carry on over to the Cluanie Inn. My curiosity led me to do some digging and I discovered that this track is actually the remnants of the old motor road north - the actual "Road to the Isles" - which was closed when the dam at Loch Loyne was built and the water level raised. By the wonders of modern technology, I was also able to follow the track on satellite/aerial imagery and on some images the road was still clearly visible for its whole length beneath the water. My instincts told me that there must be some occasions when the water level would be low enough to see the road in its entirety. A couple of emails to Scottish Hydro confirmed that this was, indeed, the case and the best time would be late September/early October as the water levels are drawn down in preparation for the winter. However, no one would be able to confirm when the required level had been reached. The idea went on the back-burner for a while - 18 months or so - but eventually, I decided to head up and have a look. In order to make it more of an adventure, I also decided to do some bike-packing and spend a couple of days on some tracks I knew, and some I wanted to explore. The ride started at Invergarry. Looking around for somewhere to lave the car safely, I decided to ask in the Invergarry Hotel and was very pleased when they suggested I just leave it in the car park. From there, I was able to get onto the riverside path, signposted as a Right of Way to Tomdoun. After a few km and a short stint o the road, I reached the car park and the forest road. I had a really pleasant trip along here, in countryside I'd often seen from afar and was delighted when, after a while, I recognised the route of the A87 high up on my right and I could even make out the car park where everyone stops to see the famous view of Loch Garry - the one that makes it look like a map of Scotland. The bike, which had being going great guns, then decided to let me down. Well, to be specific, the bottle cage did. Spurred on by the thought of saving a few extra grammes, I'd bought a Titanium bottle holder. Here was I on only the third outing and it had snapped in two, expelling the bottle which caught, momentarily, in my legs before hitting the track. 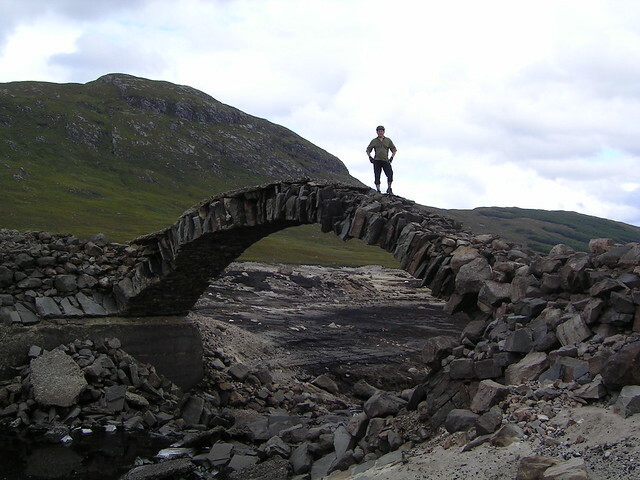 Soon after, I reached the bridge over the loch - around the central belt if you like - and the road to Tomdoun where I stopped for a pint and a sandwich. This was a very friendly little place, the staff genuinely interested in where I was off to. When I told them, they were able to confirm that the road was in fact completely uncovered and in fact they kept a key to the gate so that car drivers (a 4x4 would be recommended) could drive up for a look. I was very comfy at the Tomdoun, so much so that I could have quite happily had another, but having some distance to go, I thought I'd best press on. After passing the locked gate, I found the old road. Patchy tarmac in most places, with roots and grass breaking up the surface. A short climb and then the view opened out over Loch Loyne. Vaguely, ahead of me, I could make out the road crossing the bed of the dried up loch and a Land Rover parked just before the first of two bridges. The first, lower, bridge was pretty much intact. Much of the tarmac layer had been removed through the action of the water, but it was sturdy and firm. The remains of the second bridge also looked, at fist glance, to be fairly sound. Only upon closer inspection was it clear that half of the road width had collapsed. That, and the stripping of the tarmac layer, left a jaggedy puzzle of rocks which I crossed (on foot) with some trepidation. It did, however, stay up at least long enough for me to get a passing couple to get a photo of me on it, just for scale. Beyond this, a causeway led over to the higher ground and I was soon on that, now heading for Cluanie. The old road carried on in the same patchy tarmac way until it crossed the shoulder of the South Glen Shiel ridge, and now I was on familiar ground again. Dropping down to the Cluanie Inn was really quick and then I found myself at the bar for the second time today - ordering beer and a fantastic toastie. As a bonus, it was even warm enough to sit outside and take in the fantastic scenery. All too soon though, I knew it was time to get going and so headed back along the road again to pick up the track in to Glen Affric via An Caorann Mor . This started really well, a steep gravelly track led up off the road and I was gaining height reasonably quickly and making good progress until I reached a little quarry and then my heart sunk. The way ahead was clear enough, but it involved ankle-deep mud, heather and bracken and was almost completely unrideable. Resolve got me through. 5-6km of ankle-grabbing heather, of cursing and swearing, later and I was, at last, descending towards the hostel. The track east of this point was very bouldery and rough, but I didn't mind as at least I was pedalling and not walking. As a bonus, I knew I was very close to my chosen camp spot for the evening and so would be able to get myself organised and fed before the fast approaching dusk turned into full-blown dark. I recognised the little hillock from a previous visit and dragged the bike over the last heathery peat-hag towards it, absolutely done in. Hunger, however will not just lie down and take it, so it was on with the stove while I got the tent set up. I took the precaution of pitching on top of the hill to get the most of any midge-diverting breeze. In what seemed like only minutes later, it was full-blown dark and I settled down to dinner with that warm, fuzzy glow that is often the payback for these strenuous days. Morning dawned (I have no recollection of waking up through the night) and it was a perfect day. 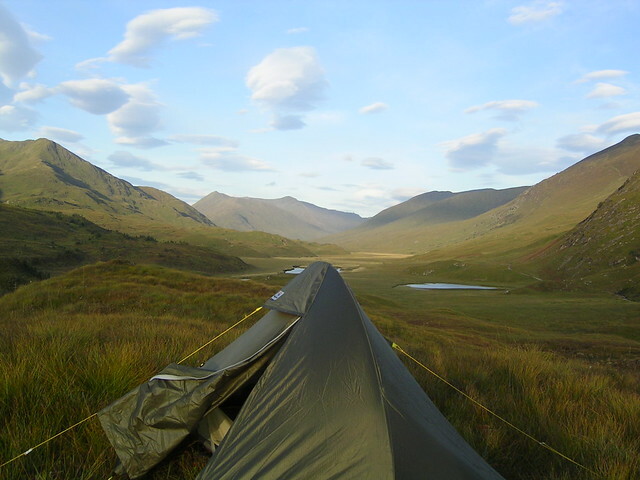 After some porridge it was to time to pack up and head towards Loch Affric. I knew the first part of the path was going to be very bouldery, but I was now fresh and enjoyed picking a good line through the worst of it. Getting to Strawberry Cottage, I was now on a much better surface and I made good time along the south side of the loch looking for my next turn off. This was easily spotted, with a Right of Way sign at the start, but the track quickly disintegrated into a rocky, rooty, muddy mess. I was off the bike again, pushing it through the mud and bracken and trying to find a route past various tress and bushes. After what seemed like 30 minutes or more, I took a good look at my progress and had to make a decision; carry on uphill not knowing how long this would go on, or divert on the longer, but faster forest roads. It didn't take me long to decide and soon I was back at the lochside, spinning away. The track along here is completely non-technical but the scenery is completely awesome and well worth exploring. Before too long, I'd arrived at the road end and headed down the tarmac for the turn-off to Tomich. Once through that charming little village, the tarmac again ends and it's back on forest road to Cougie - another of those places I'd spotted on a map and determined I'd one day visit. Have a look on the OS map. Cougie appears as this little clearing, surrounded by trees and yet at the meeting point of so many through trails. I was lucky enough to bump into one of the owners and spend a good 30-40 minutes just chatting away about everything and nothing - including some of the trails, his exploits in doing long-distance off-road routes on horse back and a forthcoming movie shot in Glen Affric. He also explained that the track I'd turned back on would have improved after a kilometre or so and would have been rideable. Not only that, but the signpost I's spotted is actually in the wrong place an should have been installed a hundred metres or so further West. I was kicking myself for lack of patience! I could have stayed longer, but it was getting increasingly overcast and it looked like I was about to get very wet. My trail to the South West started off well, heading gently but relentlessly uphill it got boggier nearer the wide and open col, which is where the rain caught me too. Finally speeding away downhill was fun, but the amount of water being sprayed up by the tyres was of biblical proportions and it was no surprise that by the time I reached the River Doe I was completely sodden. I managed to cross at a fairly wide and shallow section and picked up the landrover track to Ceannacroc on the opposite bank. My original plan had been to head along the A887 to Achlain and then over he old military road to Fort Augustus but by now, I was cold and wet and the overcast sky was bringing on an early nightfall. After a short snack and some map work, I decided that I would, instead, head directly back to Invergarry via the A87. Nice account - sounds like an awesome couple of days out!